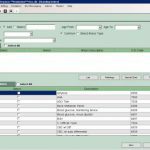 Developed by First Medical Solutions, FirstEMR is an electronic medical records (EMR) software solution catering to medical practices of all sizes. It offers on-premise and cloud deployment. The system supports various specialties including Allergy and Immunology, Dermatology, Family practice, Internal medicine (general), Cardiology, Endocrinology, General Practice, Gastroenterology, Geriatric Medicine, Hematology, Infectious Disease, Nephrology, Oncology, Pulmonary, Rheumatology, Sports medicine, Orthopedics, Obstetrics / Gynecology, Ophthalmology, Pediatrics (general), Physical Medicine and Rehab, Neurology, Psychiatry, Surgery, Urology, Behavioral health (psychiatry and psychology), Cardiovascular / Metabolic, Dermatology, ENT (ear/nose/throat), Gastroenterology, Hematology and Oncology, Musculoskeletal (works for Ortho, physical medicine & rehab), Obstetrics / Gynecology, Ophthalmology and Pediatrics. Core features of this system include an integrated E-Prescribe software Interface, new medication interaction verification with patient’s active medications, new medication interaction verification with patient’s allergies, new medication with patient’s diagnosis interaction verification, electronically submit the prescription to patient’s pharmacy and all patient’s refill requests management on one screen. FirstEMR also offers templates designed for different specialties. These templates can also be further customized to suit the practice workflow of all types. 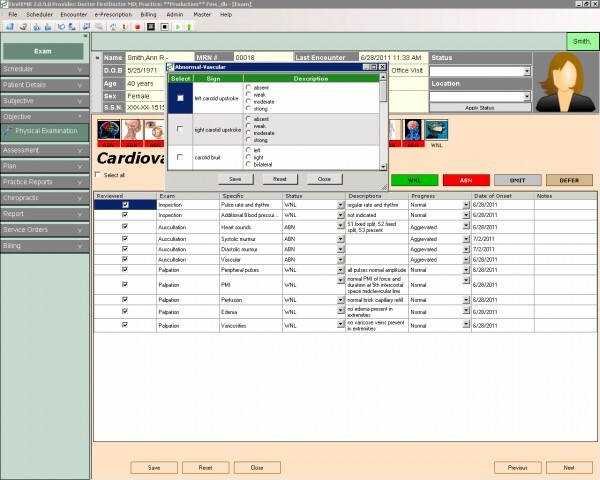 The system can also integrate with several third-party hardware solutions that enable clinicians to easily records information on patient vitals. 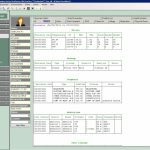 The system also holds the capability of offering educational handouts to patients which contain information on medicines, diseases, and courses of treatment. The software allows practitioners to save time and have the flexibility they need when entering new patients into the system. 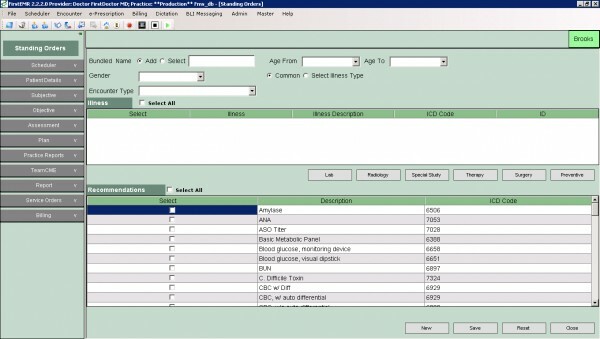 Clinicians can update Patient records instantly as the input new details arrive or the Patient information changes. 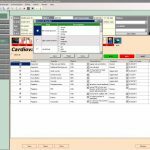 This EMR software also features an integrated common medical terminology dictionary and a medical spell-checker stylizing industry-standard Medical definitions and Healthcare verbiage. FirstEMR is ONC–ATCB certified and is also Meaningful Use compliant. 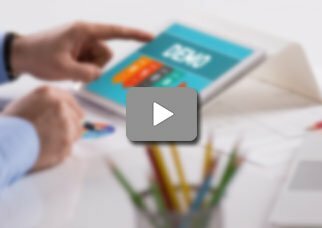 If you are a medical practice looking for a web–based EHR solution offering e-prescribing, medical document management, patient appointment scheduling, and health records management, then this might just be the system you need! Pros: I felt like I was rewriting the FirstEMR software are impatient trainers we felt the training was OK.
Cons: I don't like to being able to call software help directly. Verdict: It really appeared we could do all of the things we wanted to with it of medical records and it looked like he'd save some production. Pros: We used several other programs and without a doubt FirstEMR Evolution Software is the best. Cons: I don't usually go into detail like this when I write reviews&comma; but I'm hoping that this experience illustrates. Verdict: I can definitively say that FirstEMR Evolution Software is the best. Patricia, National Sleep Solutions&comma; Inc.
Pros: Some effort on creating my medical forms I'm actually having a great experience using this electronic medical record system. Cons: But he mentioned their templates and that they had a great iPad application helped him save time. Verdict: I had never seen FirstEMR Evolution Software any of our conferences and none of the EMR. Pros: It has been really to work integrate FirstEMR Evolution Software into our supported electronic health records vendors. Cons: First EMR stores less information about patients&comma; doctors&comma; and facilities. Verdict: I worked at a startup building medical devices and we wanted to EHR support into our product. Robert, Surinder Saini MD Inc.
Pros: The ability to access information across all are great also being able to house all patient information in one place. Cons: Furthermore the permission access poses problems at times. Verdict: I have found the Vendor support to be excellent and prompt for prescriptions is a breeze. Pros: I enter the lane my tech has one she uses for patient work-ups&comma; So the patient's data is readily available one. Cons: Now there is a slight learning curve&comma; but that is the case with any software product. Verdict: Patients enter their information on iPad including reason for visit etc. Pros: My patients and pertinent information based on templates for my specialty electronic medical record system. Cons: I find slight delay in syncing. Verdict: Sometimes at peak hours holding a cloud allows me to maintain eye contact with the patient the function which.